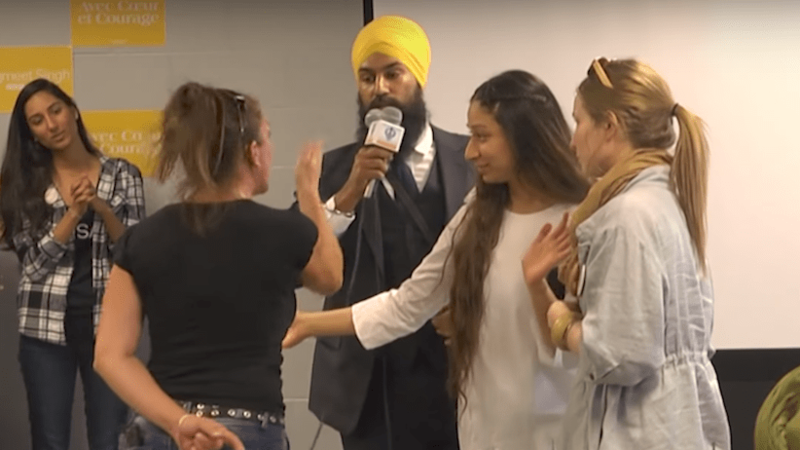 On Wednesday, MPP Jagmeet Singh who is one of the four candidates running for the leadership of Canada’s third largest political party, the New Democrat Party (NDP), was interrupted by a Muslim hating heckler Jennifer Bush who took him a Muslim and pressed him as to why he supports Islamic Shari’ah. In Sikhism, wearing a turban is a religious obligation – but not in Islam. Some Muslims do wear turban in Afghanistan, India, Yemen, Sudan, Nigeria, and Pakistan. But their turbans are totally different from Sikh turbans in style (watch below). Jagmeet Singh is a lawyer, labour union activist and supports more benefits for the senior citizens. There are four candidates for the NDP leadership; Niki Ashton, Jagmeet Singh, Guy Caron, and Charlie Angus. Israel lobby B’nai B’rith Canada slammed Niki Ashton in July 2017 for showing her sympathy for Palestinian victims of Israeli terrorists. “Jagmeet Singh is familiar with the dynamics of the Middle East, and has frequently taken principled stances on topics related to the region. His leadership opposing the Ontario legislature motion condemning BDS in 2016 is recognized, as have been his statements against the rise of Islamophobia in Canada. Since his election, Singh has taken impressive stands condemning Islamophobia, issuing dozens of statements stressing the importance of naming it as a specific form of racism that must be addressed by the government. Nevertheless, his approach to questions on the Middle East is generally more cautious and has not always been as forthcoming as Ashton in terms of his policy. With Singh as leader, NDP policy on the Middle East might become more progressive, but not quite as energetically or assertively as it would under Ashton,” concluded the assessment. Canada’s New Democratic Party, is an improvement of Canada’s former anti-capitalist, the Cooperative Commonwealth Federation (CCF). NDP founded in 1961 has a history of Zionist Jew and Christian Zionist leadership such as David Lewis and his son Stephen Lewis, and Bob Rae. Canada is home to Jewish lobbying groups such as B’nai B’rith, Jewish Defense League (JDL), and the Center for Israel and Jewish Affairs (CIJA) as part of Israel’s Hasbara Mafia. Toronto-based journalist and activist Naomi Klein in an interview she gave to NOW magazine (July 2017) said that NDP needs a leader like British Jeremy Corbyn or American Bernie Sanders. Canada is home to over one million Muslims – making them the largest non-Christian community in the country. This entry was posted in General and tagged Islamophobia. Bookmark the permalink.